The BTI Consulting Group has helped professionals boost client service, attract new business, and drive superior growth for over 30 years. We have conducted more than 17,000 independent interviews with C-level executives worldwide and provided custom research and consulting to Fortune 10 companies—and virtually everyone in between. You’d be shocked by what your clients are really thinking… about you. Only 42% of clients recommend the law firm they work with most. See where you stand. For 30 years, we’ve successfully helped our clients strategically drive revenue, boost performance, attract and retain clients, develop more business in new and existing markets, and create enduring relationships with our data-driven customized programs and solutions tailored to meet each client’s specific and unique needs. 72% of clients want to give you their feedback but only 30% of firms ask in a meaningful way. We help you reveal powerful, defining client insights you simply can’t get anywhere else through innovative, world-class feedback. 82% of professionals don’t believe they have the skills to develop business in a meaningful way. We help you and your firm catapult your business development skills, culture, and mindset, fast. Clients rate their law firms at 8.6 out of 10 for client service—not enough to get new business or premium rates. We help you redefine how clients think about you and your firm for the short and long term. We examine the market from your client’s perspective with a measurable, innovative, and high-impact approach. 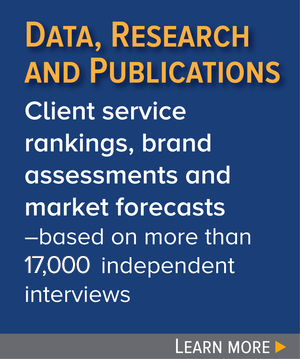 From in-depth independent research to one-on-one interviews with C-suite executives, top legal decision-makers and market leaders, our expertise and insight will help you understand—as well as benchmark— how clients acquire, manage, and evaluate their professional service providers. Clients expect 6 of these activities—these are the minimum requirements. Another 4 create relationship bliss—we call these The BTI Fabulous Four. These will change your relationships forever. Download our gold industry standard—insightful and compelling reporting and research, client service rankings, litigation outlook, market forecasts and more. Client relationships are like carbon: they can be charcoal, or they can be diamonds. It all depends on how you build them. Learn to make every client relationship a brilliant, enduring, high-value diamond with two-time Amazon best-seller and Kirkus Reviews Best Book. Join the more than 20,000 readers who stay updated each week on all the latest thinking, rankings, trends, and big industry news from BTI’s very own The Mad Clientist.